You can select these three fields from the Film table. 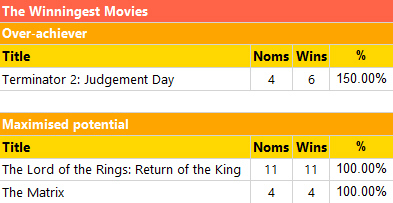 Apply a filter to the dataset so that only films with at least 1 Oscar nomination are selected. Use the Sorting page of the Tablix Properties dialog box to do this. This type of mistake won't happen when Skynet is in charge. Feel free to change the category names. You could add totals to the OscarNominations and OscarWins columns.